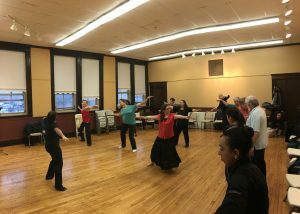 On February 11, 2018, CarlaOteroDance offered an Afro-Caribbean Dance Workshop at the E.B. Newton School and Cultural Center in Winthrop, MA. The event was a huge success where everyone in attendance left having learned more about the exciting style of dance. 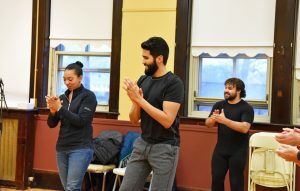 The workshop started with a brief introduction of the instructors, Carla Otero and Etienne Hernandez, followed by the history of “Bomba”, a style of dance originating in Puerto Rico, which inspired the movement taught during the class. Sitting in a circle, everyone shared their name and what they hoped to get out of the afternoon’s activities. Attendees came from all walks in life, people who had trained in belly dancing to ballet and some who had never danced before. After getting to know one another, the event started with a warm-up, lead by Etienne. There was a gentleman in attendance who was blind and Carla assisted him with the movement through light touch and descriptive communication. Everyone followed along expertly, starting from the top and working their way down to their feet. 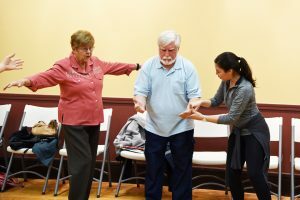 About twenty-minutes of breathy movement and seeing how everyone interpreted the warm-up exercises, the guests started to interact with one another. People were paired up to move across the floor practicing steps that would come into to play during the choreography portion of the workshop. Some moves were combining step touches with jumps and claps along to the beat of the music, three point turns and deep pliés in second position. 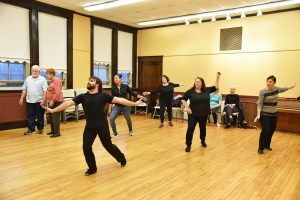 Carla divided the group into two so that each individual had enough space to dance as expressively as they desired. This method also gave a chance for the instructors to see the movement and for guests to see how others were moving to the music and interpreting the dance within in their unique way. Finally, the teaching of the choreography was complete and both groups enjoyed showing off their talents back and forth several times. 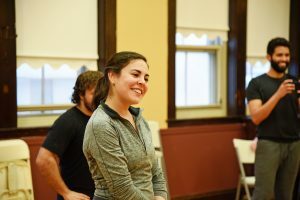 To end the dance portion of the workshop, Carla lead the cool down where once again everyone followed along gracefully though slow elongated moves and articulation of the spine to finish with a full body stretch. Everyone took a seat in a circle and Carla asked everyone to share any takeaways they may have had from the workshop. Some of the most resounding comments were the positive energy that ensued throughout the afternoon and how great it was to try something new, move again and leave the stress and worries of the week behind. 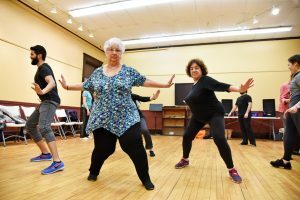 Many expressed how they were inspired to dance more and even asked the instructors where they could practice the moves they had learned that day during a night out. 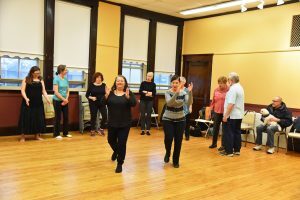 Inspired by the workshop Carla Otero expressed she was encouraged to offer more events like these that are open to the community free of charge to keep spreading the joy of dance. 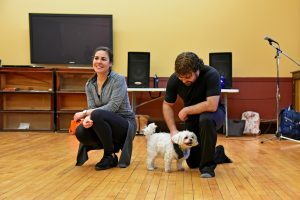 They even had a furry friend (Happy) who took the class too! 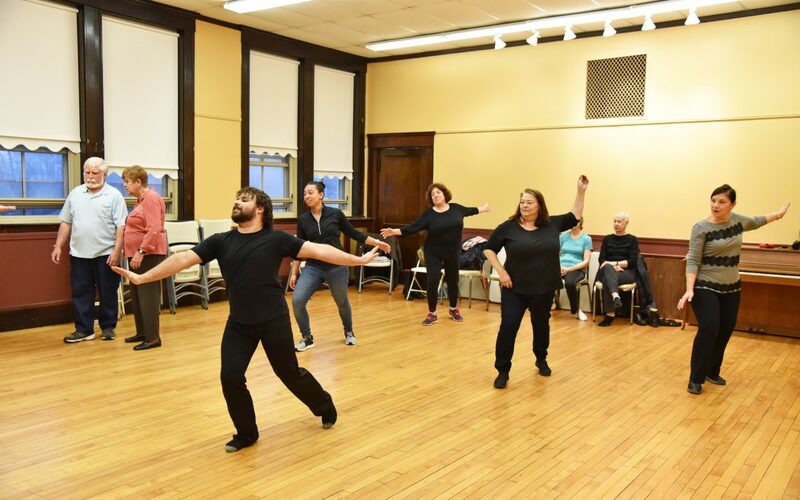 *This program was supported in part by a grant from the Winthrop Cultural Council, a local agency which is supported by the Mass Cultural Council, a state agency.